Mr. Singh wearing google glass while testifying. As Congress moves forward with integrating more prizes and challenges for crowdsourcing scientific research, one expert from Silicon Valley raises important issues in the government’s approach. Narinder Singh, the co-founder and chief strategy officer at Appiro, a cloud based Technology Company that uses crowdsourcing to solve problems, was invited to speak before the House Science Committee’s research subcommittee earlier this month. 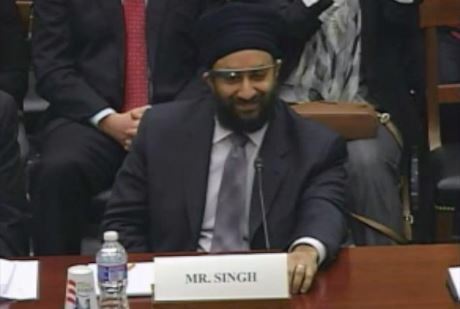 Singh addresses the lawmakers in a hearing on “Prizes to Spur Innovation and Technology Breakthroughs.” Singh, addressed the committee while wearing Glass, a new wearable lens from Google that allows the user to take images, record and retrieve information using voice commands. After an introduction to Appiro, Singh described the company’s [topcoder] program, which is a community of 600,000 designers, developers and data scientists who serve as an exclusive “crowd” for crowdsourcing client problems. Using this group, Appiro breaks down complex problems into smaller projects, presenting them to the crowd to solve and awarding cash prizes for the best solutions. To date Appiro has partnered with NASA, Centers for Medicare and Medicaid Services and the National Institutes of Health to design and implement a variety of challenges and prizes using the topcoder crowd. Singh outlined some significant barriers to partnering with government to carry out challenge competitions, singling out H.R. 4186, also known as the Frontiers in Innovation, Research, Science and Technology Act, or FIRST ACT, for criticism. The bill, introduced by Lamar Smith (R-Texas) and Larry Bucshon (R-Ind.) on March 10th, encourages research and development funding for the National Science Foundation and the National Institute of Standards and Technology and includes language promoting the use of prizes and challenges—similar to what Appiro does with its [topcoder] program. While the FIRST act is a step in a positive direction, Singh notes that the act currently would require all judges in these competitions to disclose financial interests. But in the crowdsourcing community, the judges are part of the coding community, which would make disclosing this information onerous and difficult because each challenge contains a large open-source and often computer regulated judging program. Asking each judge to disclose financial interests would slow down the rapid innovation and iterative process that are hallmarks of crowdsourcing challenges and prizes initiatives. Using the FIRST act as an example for broader tech engagement in the government Singh notes, “it would be unlikely that [ topcoder] or similar communities would choose to greatly expand presence in government sectors if requirements of audit and financial reporting remain hardwired for legacy approaches to government contracting.” A careful look at the relationship between bureaucracy and crowdsourcing innovation will be needed to scale private and public relationships in the technology industry.